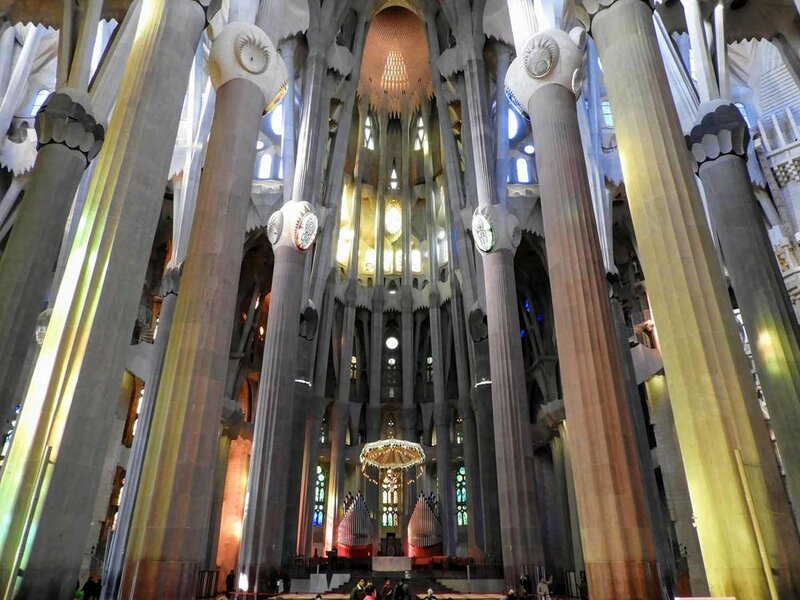 The La Sagrada Familia is unlike any other place of worship we have visited, and we'll even venture to say, the world. Antoni Gaudi, renowned Spanish Architect, and devote Roman Catholic, embodied all of his passions within La Sagrada. The cathedral is a perfect combination of traditional Gothic elements, religious symbolism, and natural whimsy. The organic interior columns tower over you like trees and the light within the cathedral is dappled, like a forest canopy. We visited in mid-afternoon while the sun was shining brilliantly through the stained glass windows, creating a rainbow of colors throughout the cathedral. We've never experienced anything quite like that before. It's captivating. Best known for his Catalan Modernism / Art Nouveau works, Gaudi was not the first architect of La Sagrada Familia, but after becoming the chief architect in 1883, he dedicated his entire life to its design and construction. Upon Gaudi’s unexpected death in 1926, it is believed the cathedral was only 15-20% complete. Despite his diligent efforts, Gaudi knew La Sagrada Familia would not be realized before the end of his lifetime and chose to focus his efforts on the Nativity Facade. Due to it's extensive construction, one can quickly see the difference between the new, clean stone, and the old, weathered stone of the cathedral When asked about the lengthy timeline of the project, Gaudi responded “My client is not in a hurry”. The work to finish La Sagrada Familia continues today, but hopes are high to complete construction by 2026 - the one hundredth anniversary of Gaudi's death. It's already a site to see and we can only imagine how magnificent it will be then. The entrance fee is a bit lofty (15 euro - 29 euro). We opted for the least expensive ticket, but felt it was worth it. By purchasing a ticket, you help build the cathedral and make Gaudi’s life-long dream a reality. Capacity is limited and tickets must be purchased for a specific time. Don't wait to purchase your ticket until you're ready to enter or your daily itinerary may be thrown off. We purchased our tickets and then wandered around a Christmas market outside the cathedral. Tickets are slightly cheaper online. 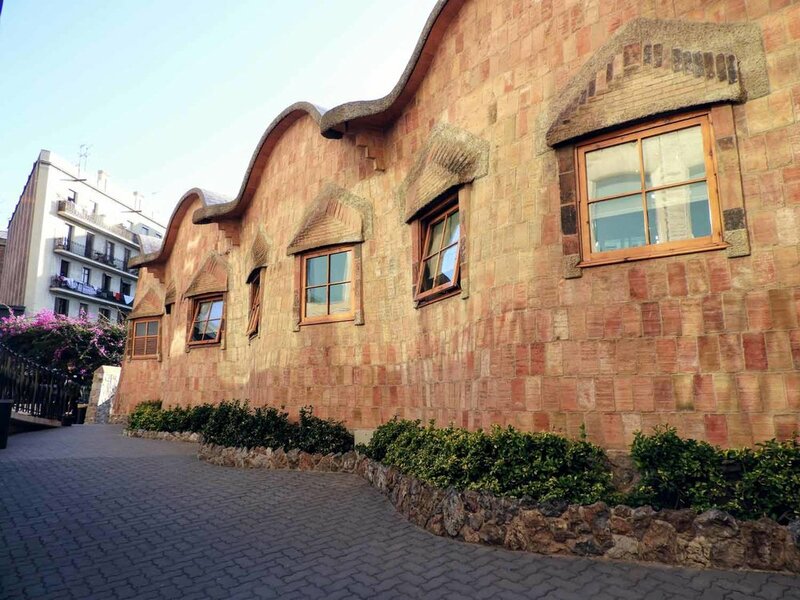 We wish there was a better “Gaudi Bundle” allowing you to get in to a number of Gaudi sites at a reduced price. The Barcelona Card or Barcelona Pass wasn’t worth it in our opinion. The Barcelona Card did not provide entrance into La Sagrada Familia or Casa Battlo, but rather offered a 4 euro discount between the two. The Barcelona Pass provided entry to Casa Battlo, but not to La Sagrada Familia. It was cheaper for us to buy tickets to La Sagrada Familia and Casa Battlo separately (we visited Parc Guell, but not the paid portion). You can't control the weather, but check the forecast and set yourself up for a successful visit during the sunniest part of the day.